I have some shirts I'm bandying about to see if there's any interest. I want to offer them on comfort T's which are pre-washed and come in a variety of nice muted colors. Did you intend to have the rectangular-shape background behind the schematic? If the background can be removed I'd be interested. Ditto. If you can remove the background, you've got a winner. I would suggest hyphenating S-IC to be consistent with the official designation. I like it. Would you ship to the UK and what sort of price are we looking at? I commend your efforts by the way. I can print it without the background. I was kinda going for a vintage note page type deal, but it didn't come out the way I'd hoped. So I will delete that. As for price I'm looking about $12.00 a shirt plus shipping to anywhere. As for the designation, what would it read like in your opinion? I am open to suggestions. 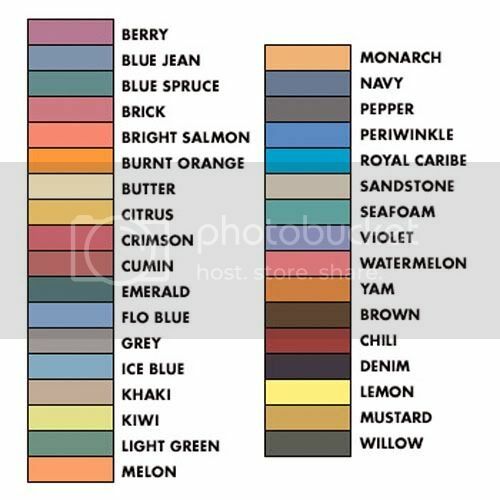 I would like to get info on size, shirt color and quantity so I can get an idea on how many I'll need to print. please forward that info to me at mastronaut@gmail.com. I'll keep you posted as to when the shirts will hit the press and be shipped. I will be accepting PayPal. Thanks for the interest! There will be many more designs under the 'Schematic Series soon! 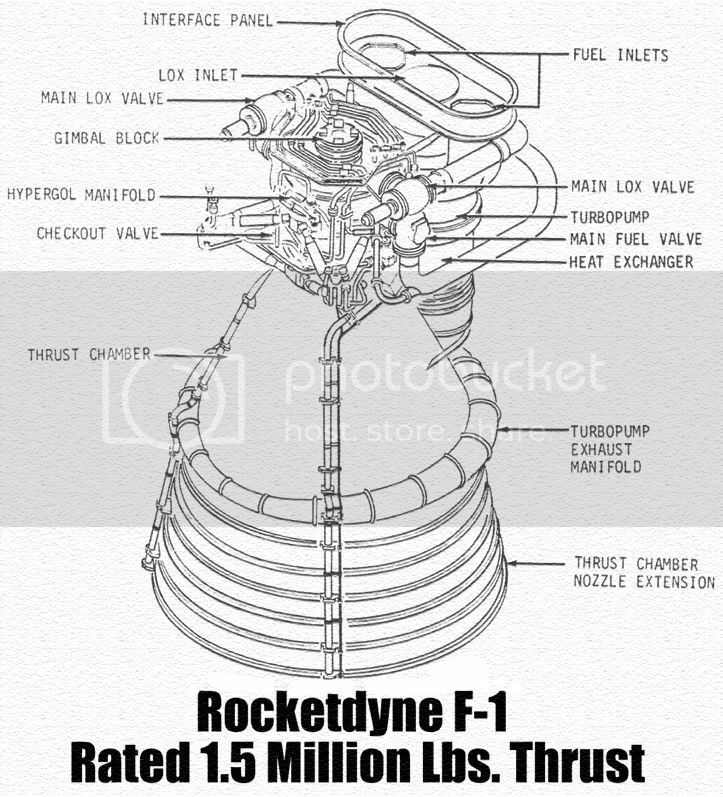 If you're open to renaming it, I might suggest "Rocketdyne F-1 Engine" or "Rocketdyne F-1". Excellent suggestion! Thanks this has been a dream of mine since Apollo 11 in 1969 when I was 8 years old! Okay, this is the final re-work. It looks like there is still a pattern/static behind the graphic, which will create a rectangular on the shirt. There is a large, clean scan of the artwork here, if it helps. The link Robert provided for the artwork is certainly better than yours. However, there are still quite a few "broken/faded lines" in it that will read like a bad printing job on the shirt. It would take some time, but redrawing those lines will provide a much better product. The sample is just for the idea, there will be no background at all. It will look like the scan Robert put up. (thanks Robert). 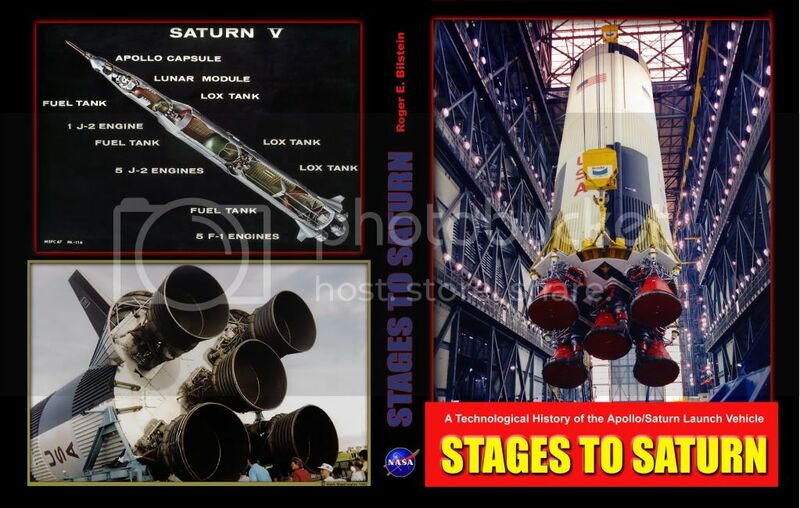 I recently purchased a mint hardcover copy of Stages to Saturn. I made a dust jacket/cover for it, brought it to my local library and had it plasticized. Feel free to download it here if you want a copy. Note: The Saturn V photo on the lower back pane is one I took when I visited KSC in 1992. 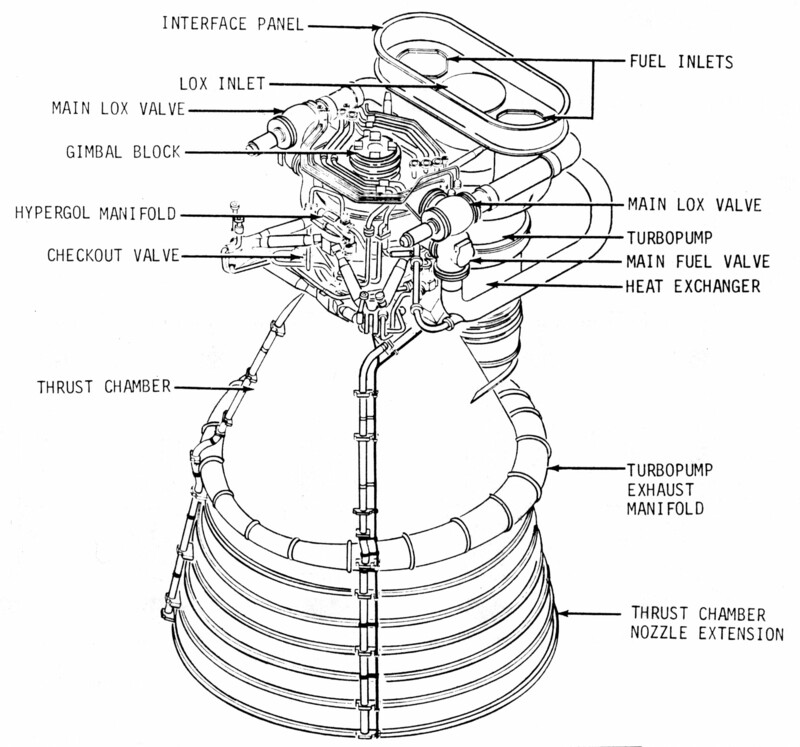 I have a larger, cleaner scan of the F-1 diagram from the Saturn V News Reference on my website. It's a different, slightly more detailed diagram, rotated about 90 degrees compared to the diagram above to show the heat exchanger and turbopumps. Feel free to "appropriate" that one if you find it more to your liking. Count me in for a shirt when you get settled in. Looks like a good plan. Count me in too. I'll need one to wear while I'm building my Accurate Miniatures 1/20 F-1 kit. I'll want one as well. Keep us posted! I am back on track and ready to print! I also have another design ready to go as well. Please send size and shirt color info to my email. As soon as I get the pre-orders I will ship them when payment is received. Thanks for your patience! Ayone else out there? I'm goin to press this coming week! There will be no NASA Meatball on the shirt.